What do you get when you mix an Iranian-American writer/director, an international cast, and California locations into a “Vampire Western” motif told in Persian and filmed in Black and White? Ana Lily Amirpour’s 2014 film ‘A Girl Walks Home Alone at Night‘ breaks apart genres and cultural identities to create something wholly unique and utterly breathtaking. When you live in a town called “Bad City” you can’t expect many happy endings. This is a town where the outlying ditches are filled with the bodies of the dead and whose only scenic beauty comes from a nearby power plant and the oil rigs spewing pollution and noise into the restless wind. 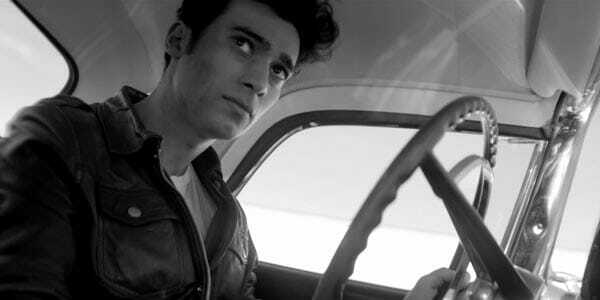 Arash (Arash Marandi) is a twenty-something living with his junkie dad (Marshall Manesh), pruning hedges for the wealthy to get by and combing the night in his fifties-era American sports car. However, Arash has a kindred nightly spirit, a vampiress (Sheila Vand) stalking her victims, seeking only the most worthy. A loner, like Arash, whose thirst for companionship is only surpassed by her thirst for blood. One night after leaving a party Arash stumbles across The Girl rolling by on a recently “acquired” skateboard and their destinies fortuitously entwine. These two loners, who for no reason should ever feel anything but abject sadness, somehow find a sense of belonging and a sliver of bliss together. The stark beauty of the framed B&W cinematography and an eerie sound design intensify the aura of gloom and predation that seeps through every pour of Bad City. And seasoned throughout is a wonderfully Morricone-esque musical score peppered with quirky Pop songs. A slow-burn pace allows the story to mold the characters with minimal dialog. And the use of Persian/Farsi (not English) only adds to the isolation and other-worldliness. Striking visuals of a young woman in a head-scarf prowling for male victims is powerfully cathartic role-reversal. A hyper-kinetic bizarro reality that presents as not-so-subtle commentary on global gender roles, particularly towards the Muslim community. Yet, like many avante-garde works, there’s a general lack of emotional connectivity. Despite sympathetically developed characters, we just can’t properly relate to this wholly alien world. Still, I’ll never knock any well-crafted piece of film for (just) overt weirdness. Always looking for fresh means often seeking something a little bit different. If you appreciate film auteurs like Wes Anderson, David Lynch, and Jim Jarmusch the Iranian Vampire Spaghetti Western ‘A Girl Walks Home Alone at Night‘ is a much welcomed surprise. 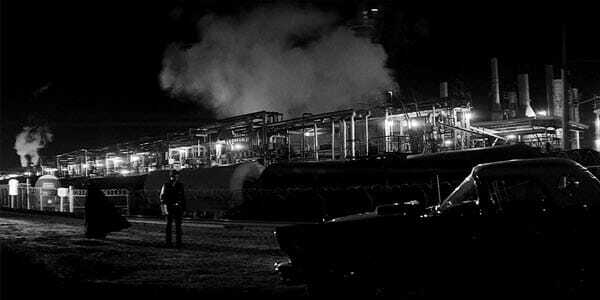 Picturesque B&W cinematography and stark visuals draw us into a world both vastly different from our own and still eerily familiar. Exists as both stylized horror cinema and biting social commentary.